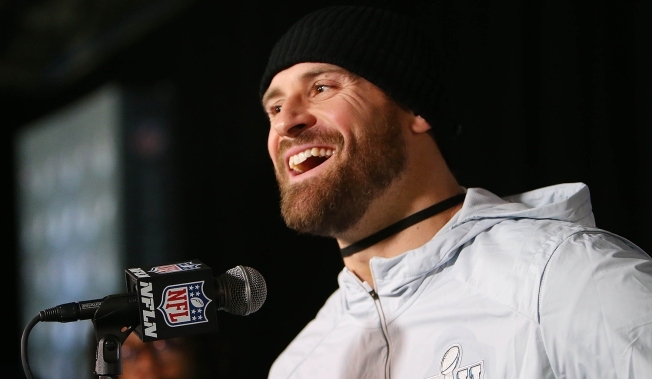 Chris Long is one of the more enjoyable Philadelphia athletes to cover in recent years. He's outspoken, does incredible charity work, and helped bring a Super Bowl championship back to Philly. Oh, and he wore an Allen Iverson jersey under a faux fur coat to the parade. Legendary. All of that and he just seems like relatable guy you'd want to have beers with and watch a big sports game. Like, say, the NCAA National Championship. Long, a University of Virginia alum, was lucky enough to attend the big game out in Minnesota last week and it helped land him on the cover of Sports Illustrated. Sort of! Check out his pretty hilarious tweet about the cover. Long is indeed on the cover of SI that features the championship Cavaliers. He just happens to be a fan in the background. And he is caught in a perfectly joyous pose. If you can't see it, click the second photo in his tweet and zoom in right under the second 'A'. I think it's safe to say Long really enjoys championship games played at U.S. Bank Stadium in Minneapolis.